Dormers and gables welcome you home to this updated farmhouse with lots of extras. Blending the right amount of open spaces with private recesses, The Wedgefield includes front and back porches, a screened porch, and bonus room. The spacious great room is set off by a soaring ceiling with a dormer, and the nearby dining room expands entertaining space to the deck through French doors. The centrally-located kitchen is spacious and open to the adjacent breakfast bay. 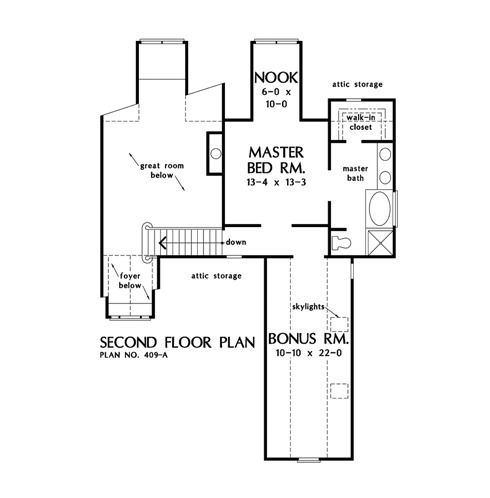 Completing the first floor are two bedrooms and a full bath. Upstairs, the private master suite has a cozy sitting nook in the bedroom and a sumptuous bath featuring a garden tub, double bowl vanity, and walk-in closet. 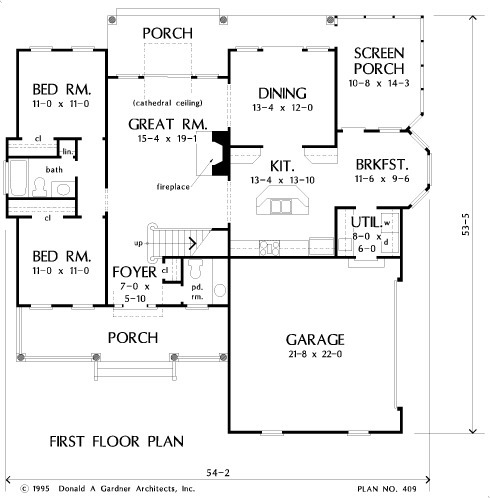 1st Floor: 1395 Sq. Ft.
Porch - Screened: 160 Sq. 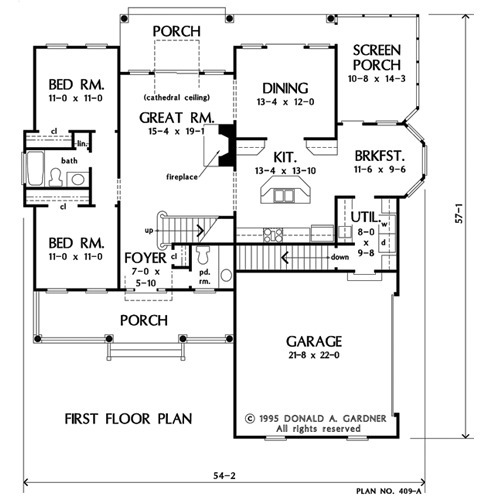 Ft.
House Dimensions: 54' 2" x 53' 5"
Master Bedroom: 13' 4" x 13' 3"
Foyer : 7' 0" x 5' 10" x 8' 0"
Great Room (2 Story): 15' 4" x 19' 1" x 17' 0"
Kitchen : 13' 4" x 13' 10" x 8' 0"
Breakfast Room : 11' 6" x 9' 6" x 8' 0"
Bonus Room (Vaulted): 10' 10" x 22' 0" x 8' 0"
Master Bedroom : 13' 4" x 13' 3" x 8' 0"
Porch - Front : 27' 0" x 7' 0" x 0' 0"
Porch - Rear : 15' 4" x 7' 9" x 0' 0"
Porch - Screen : 10' 8" x 14' 3" x 0' 0"